The aim of this 5 day course is to introduce the student to time tested and operationally proven drills and procedures in order to establish or further enhance an existing explosive breaching program within their unit or department. This course has been designed for non EOD Technicians who have little to no experience in the recognition and safe handling of explosive compounds. Day one will be devoted to the theory and handling of explosives with days two-five focusing on explosive breaching techniques. On successful completion of this course, the student will possess the necessary skills to safely and confidently employ explosive breaching charges in support of special operation missions. This course is two 10 hour days. It is a demanding course loaded with information, range exercises and dynamic drills. Students should be of the physical ability to withstand two days of constant movement. Day one will conclude with a Night Lab exercise. Your duty weapon is required however, if you are certified with the Patrol Rifle, you may use this weapons for some of the exercises. You will need 500 rounds pistol or 300 rounds pistol and 200 rounds rifle along with extra magazines and mag pouches. We will also be drawing from concealment therefore a concealment holster and jacket/vest are required. 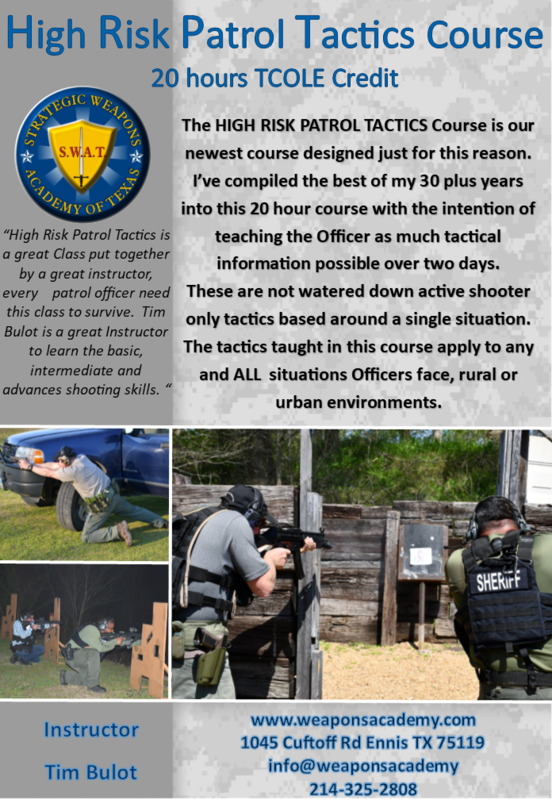 *With over 30 years in Law Enforcement plus 8 years full time working over seas in the tactical field, you wont find a more experienced instructor offering a course such as this one for only $169.00!! This course easily beats out other courses costing 3 – 4 times more! Students will receive 20 hours TCOLE credit through Navarro College Police Academy. I have always taught and to this day believe it is on the individual Officer to see to it that they have the best training possible. Most Departments are overwhelmed and burdened with scheduling and providing the many mandated course required these days. NONE of these have anything to do with Officer survival. It is for this reason that I keep my price VERY REASONABLY and anyone who has taken one of my course will tell you that I give you my 100%, every course I teach! You will work hard in this class any you will leave with fresh knowledge and more familiar with tactics that you will be able to employ on your very next shift, should the need arise. We all want to go home every day to our families I have committed myself to training as many Officers as possible so that we all go home! 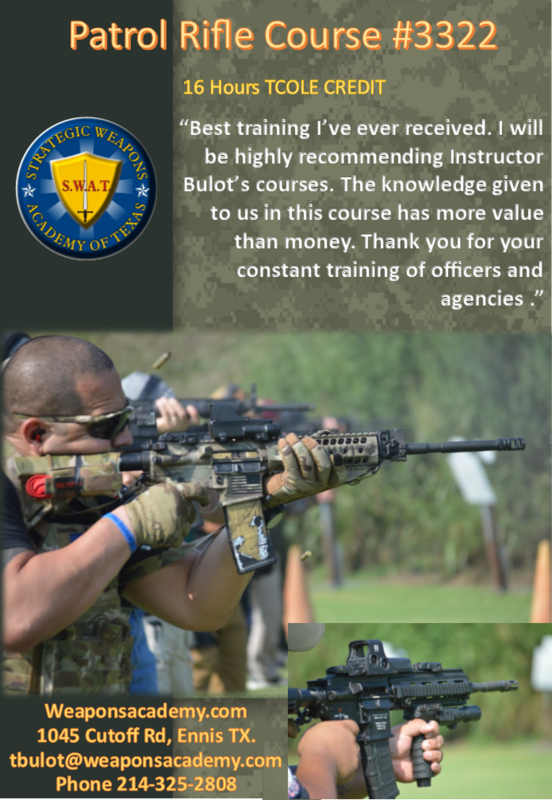 The Patrol Rifle Course is designed specifically for Peace Officers desiring to deploy or carry the AR15 or similar style weapon in the performance of their duties. This course includes an informative theory session followed by a progression of live fire drills covering essential fundamentals and skills needed to deal with increasing threats we may encounter. 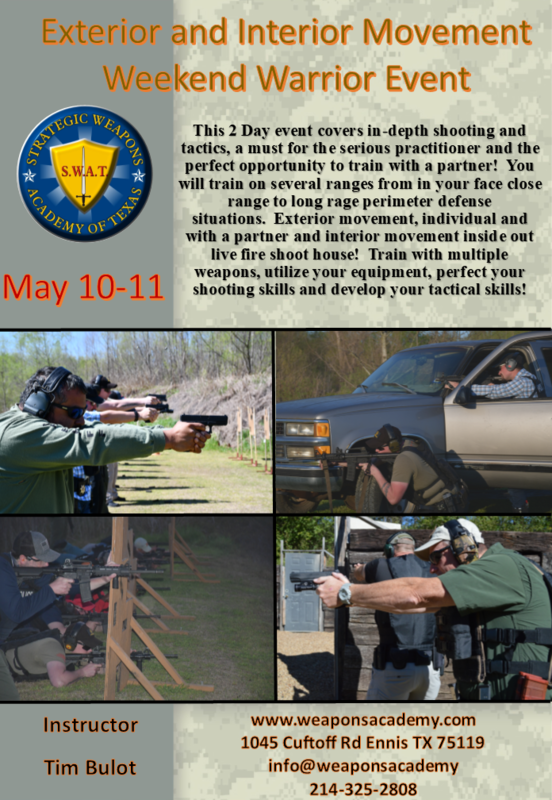 Students will complete a TCOLE qualification and upon returning to your agency, will be fully qualified to carry. Today Law Enforcement Officers are seeing an increase in violence being directed at law enforcement by illegal groups and criminals that are pouring into and operating in the United States. These groups have tactical training and equipment that we have seldom had to deal with in the past and they are actively looking to engage and defeat law enforcement. The Patrol Rifle Course #3322 will teach theory as well as practical application in the form of live fire drills that will get you up to speed on the attack/ambush and other violence methodology that has arrived on our door step. Upon successful completion of this course, you will be in an elite group of LE who have learned and understand how to effectively battle this increasing threat, in other words, you will better know your threat and will better be equipped to confront it. This course will be taught by Tim Bulot. 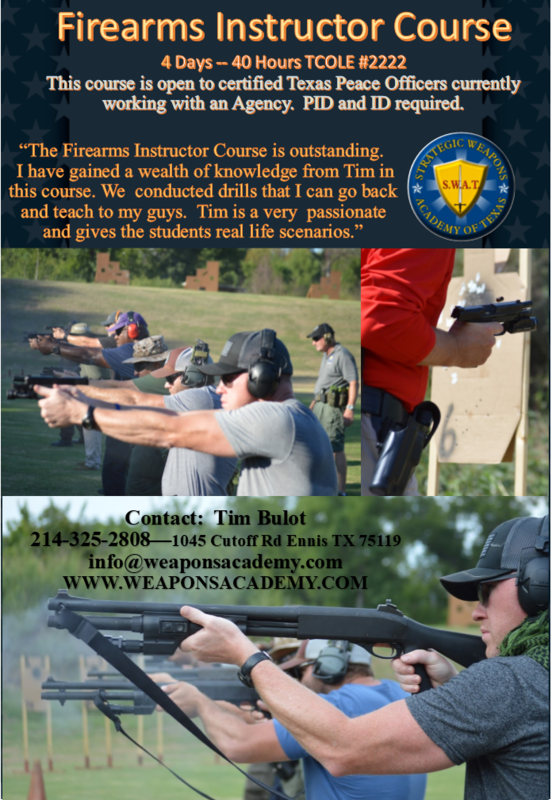 Tim has 25 Years experience as a Police Officer in Texas plus 8 years with the Department of State’s Mobil Anti-terrorism Teams. Tim was a team leader and later promoted to Sub-Director of the Anti Kidnapping Initiative in Colombia, South America. Tim completed 7 full tours in Colombia leading a MATT Team, plus time in Afghanistan, Bosnia, Yugoslavia, and numerous other Latin countries. Tim’s vast experience both in country and overseas gives him a real-world approach to his teachings and also a thorough understanding of today’s ever increasing threats.